Hope you all like this, the AFTTR, Automated Flex Twist Test Rig for measuring flex and twist of fins and hydrofoil wings. Frame is built and engineering team fitting load actuators this week. Soon will be able to measure exactly how much flex and twist fins/foil have to determine best setup for speed. No the real deal Bob, first automated test rig to measure flex and twist on fins/foils. Will be fully operational by June. By the look of those hydraulic jacks, a bit of destructive testing could happen as well. Not hydraulic jacks but electronic actuators with load cells to measure the force. Capable of 300 pounds of force each one! All controlled through computer interface. I love the engineering side of it , but how is it going to tell which fin to use ? There seems to be so many variables and opinions about fins . I couldn't get an simple answer on what fin is better to get a big guy planing , a stiff one to push against or a flexier one that creates more lift ? Size and shape being equal . Almost started a full blown argument . If i got any answer out of it , it was , get and try as many fins as u can and keep the ones you like ! With your testing device , could I suppose , if you really know what your doing ( very unlike me ) and for example you have two fins of the same size and shape with different flex or twist , and can tell the difference , one could imagine a desired direction to go to . Then get a fin with X facter , test it in the machine to see if it could be suitable before putting it in the board ? I dont think my local shop would like this test done before buying . Or is it for manufacturers of fins or logging a database ? I've used Jim Drakes old calculations to work out a load profile. Essentially max side force on a fin for 200 pound windsurfer is about 65-70 pounds. Max Lift force on a windfoil is about 230 pounds, 115 pounds per side. These forces will be applied to the fin or foil mounted in the rig. The load will be measured with load cells and applied by electric actuators. The deflection will be measured along the fin for flex and also the twist at the tip. The results will be compiled for a database and gps speeds stored as well from on water testing. Eventually a profile for speed/handling will be created. 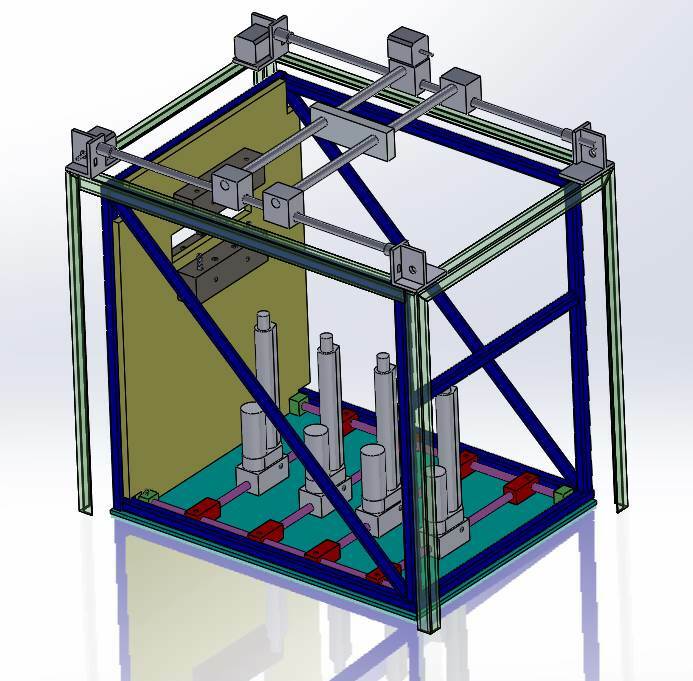 We've run FEA analysis to build the frame to take maximum load of 300 pounds being applied to the fins/foils. Finished the frame this weekend and actuators will be fitted this week and software written for computer interface. Once built it will be available here in the Gorge for testing. Will be fully operational end of May this year. Manufacturers can use it and all the results will go into a database. I have a couple of identical fins to test, same planform but different flex/twist profiles. Will allow us to catalog a base point as I know how they perform on the water and have the gps logs for each. I can see how that could be helpful . Your going to have a lot of testing and logging . It would show variations in identical fins and if more expensive brands have better consistency in manufacture . Some brands might not like you . It would also show if fins change after use , ( i would think getting considerably softer the more they get used with constant flexing ) . Or even test for unacceptable failure rates depending on rider weight and conditions , ( i would like to know if my fin was about to break ) . Im liking your device more and more ! To build a better fin/foil you need to measure its characteristics so you can replicate and improve it. It's a long term project to ultimately build a more controllable hydrofoil that will also go faster. I bulit a thing to do the same job back in 1992 but a lot simpler. Load was applied by sailboat ballbearing pulleys and rope with weights or a spring ballance. Load point could be moved or a wiffle tree used to get two or four load points. All welded up from steel. Took about 2 hours to make. Was very handy. Learnt a lot ive since forgotten! Originally triggered by failures i could not work out why. Turned out the 2:1 epoxy ratio actually had to be 100:48 to get full cure and full strength. so great for qc. You can load beyond what it will see and then know its all good and you can test 10 fins in ten minutes compared to one in ren minutes on the water. I think i saw it in my shed recently. Great minds think alike Piv! I bulit a thing to do the same job back in 1992 but a lot simpler. Do G10 fins get softer with use? My favourite doesn't go upwind as well as i seem to remember. Maybe it's me? I think epoxy is affected adversely by UV, if they've been in the sun a lot, I could imagine this happening. I would have thought, if it does get softer, it is more likely mechanical fatigue. Piv, if you do find it, any chances could get you to stress some of my aluminium fins? Originally triggered by failures i could not work out why. Turned out the 2:1 epoxy ratio actually had to be 100:48 to get full cure and full strength. Which resin system was that ? Resin was what was k36 but is now something else LC192? When i find it i will take pic and you can make your own out of junk! Got the AFTTR up and running, been running flex tests on a bunch of 39 cm fins Interesting to see the bend characteristics and compare the performance on the water. Still sorting the coding to measure tip twist independent of span-wise flex. Will be interesting when we start measuring some hydrofoils for the SpeedFoil setup. Here's some numbers, total force applied along the fin at 4 evenly spaced points is 70 pounds. Elliptical force distribution at 4 points, moving out from the base to tip, of 21, 19, 17 & 13 pounds. Deflection measured at load points and tip. Thanks for the link Shane, I'd never seen their process before. Always good when companies use science rather than just feel to validate their products.